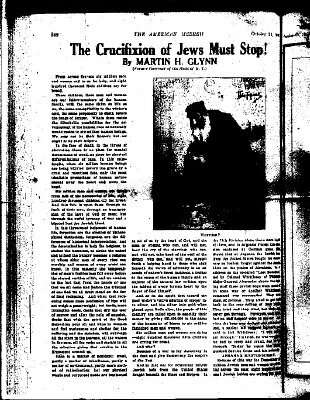 Browse: Home / The Crucifixion of Jews Must Stop! Martin H. Glynn, Former Governor of the State of N.Y.
Race is a matter of accident; creed, partly a matter of inheritance, partly a matter of environment, partly one’s method of ratiocination; but our physical wants and corporeal needs are implanted in all of us by the hand of God, and the man or woman who can, and will not, hear the cry of the starving; who can, and will not, take heed of the wail of the dying; who can, and will not, stretch forth a helping hand to those who sink beneath the waves of adversity is an assassin of nature’s finest instincts, a traitor to the cause of the human family and an abjurer of the natural law written upon the tablets of every human heart by the finger of God himself. And so in the spirit that turned the poor widow’s votive offering of copper into silver, and the silver into gold when placed upon God’s altar, the people of this country are called upon to sanctify their money by giving $35,000,000 in the name of the humanity of Moses to six million famished men and women. Six million men and women are dying — eight hundred thousand little children are crying for bread. And in that war for democracy 200,000 Jewish lads from the United States fought beneath the Stars and Stripes. In the 77th Division alone there were 14,000 of them, and in Argonne Forest this division captured 54 German guns. This shows that at Argonne the Jewish boys from the United States fought for democracy as Joshua fought against the Amalekites on the plains of Abraham. In an address on the so-called “Lost Battalion,” led by Colonel Whittlesey of Pittsfield, Major-General Alexander shows the fighting stuff these Jewish boys were made of. In some way or another Whittlesey’s command was surrounded. They were short of rations. They tried to get word back to the rear telling of their plight. They tried and they tried, but their men never got through. Paralysis and stupefaction and despair were in the air. And when the hour was darkest and all seemed lost, a soldier lad stepped forward, and said to Col. Whittlesey: “I will try to get through.” He tried, he was wounded, he had to creep and crawl, but he got through. To-day he wears the Distinguished Service Cross and his name is Abraham Krotoshansky. In the name of Abraham Krotoshinsky who saved the “Lost Battalion,” in the name of the one hundred and ninety-nine thousand and nine hundred and ninety-nine other Jewish boys who fought for Democracy beneath the Stars and Stripes won’t you give copper, or silver, or gold, to keep life in the heart of these men and these women; to keep blood in the bodies of these babies? In the world war the Jew has helped everybody but the Jew. “Over there” he helped in camp, in council and in conflict. “Over here” he helped the Red Cross, the Y.M.C.A., the Knights of Columbus, the Masons, the Salvation Army and everybody else. So now is the time for everybody to help the Jew, and God knows now is the time he needs it. But Israel is entitled to a place in the sun, and the crucifixion of Jews must stop. We repeat the war is over for everybody, but the Jew. Like Isaac the knife is at his throat, but unlike Isaac no power seems able to stop the steel from thirsting for his blood. But some power the world must raise up to prevent this decimation of a deserving race. For the peace of the world a League of Nations let us have by all means; but for the Humanity of the World, to give justice to the Jew and other oppressed peoples on earth, let us have a Truce of God! — Albany Times Union. An enlarged photocopy of this material is available here. Of course, the above document does not mean that the Holocaust never took place. Arch historical revisionist David Irving himself admits that there were “death camps”. What is at issue here is the exact numbers involved, how they died and who actually benefitted from and promoted the “Holocaust”. Was it in fact the Zionists who used the “Holocaust” to pave the way for the foundation of Israel? To answer this question, note the opening sentence of the final paragraph: “But Israel is entitled to a place in the sun, and the crucifixion of Jews must stop”. This was first published nearly thirty years before the founding of modern Israel yet it anticipates it and opens many more questions that need to be answered. Ed.